Can the F-35 Beat the F-16 After all? Yesterday, in an attempt to defend the $400 billion F-35 Lighting II procurement program, the Department of Defense responded to the recent revelations that an F-35A was defeated by a two-seat F-16D in simulated aerial combat (see: “F-35 Loses Dogfight to Fighter Jets From the 1980s”). As I reported previously, a leaked report by a test pilot noted that the “F-35 was at a distinct energy disadvantage” vis-à-vis the F-16 and—among a host of other issues—could not zero in on its aerial opponent with the plane’s 25mm cannon. The fast and determined response of the Department of Defense and the plane’s prime contractor, Lockheed Martin, is not surprising given that both organizations “have well-oiled media response teams,” as the Washington Post sardonically points out. Aircraft AF-2 did not have the mission systems software to use the sensors that allow the F-35 to see its enemy long before it knows the F-35 is in the area. Second, AF-2 does not have the special stealth coating that operational F-35s have that make them virtually invisible to radar. And third, it is not equipped with the weapons or software that allow the F-35 pilot to turn, aim a weapon with the helmet, and fire at an enemy without having to point the airplane at its target. While the dogfighting scenario was successful in showing the ability of the F-35 to maneuver to the edge of its limits without exceeding them, and handle in a positive and predictable manner, the interpretation of the scenario results could be misleading. The F-35’s technology is designed to engage, shoot, and kill its enemy from long distances, not necessarily in visual “dogfighting” situations. There have been numerous occasions where a four-ship of F-35s has engaged a four-ship of F-16s in simulated combat scenarios and the F-35s won each of those encounters because of its sensors, weapons, and stealth technology. As the Washington Post reports, last month the U.S. Marine Corps tested its version of the F-35 and announced that “it performed flawlessly.” The Marine Corps is close to declaring the plane combat ready—a significant milestone for the F-35 program. 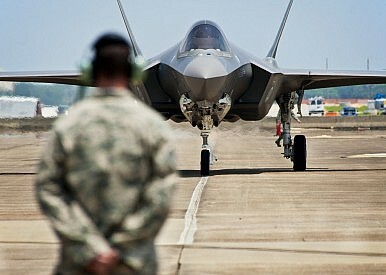 The U.S. Air Force is contemplating adding 72 F-15, F-16 or even F-18 fighter aircraft due to low F-35 production rates.